Do you ever just go all day as fast as you can in the hope that at the end of the day you’ll feel a little better? If you can just get enough done, it’ll take that pressure off. Of course, everything you do seems to take one thing off the list but add two more. And then it happens: you reach your tipping point, the thing that pushes you over the edge. Most recently for me it was Safety Patrol. We were just getting back into the swing of school, which I thought was supposed to make life easier. The five emails a week, however, basketball and soccer starting, multiple log-ins to new web portals, school events and homework were really stressing me out. A bazillion new things to keep track of and remember. Great! I’m thinking, “Can’t they just send me one long list of everything I need to know, sign-up for, pay for, donate to or do for the entire school year? I’ll do it and then they can leave me alone.” I know, sounds terrible, but I can only handle so much. Then my oldest announces that he’s signed up for Safety Patrol, which I thought we decided not to do, but somehow we did. I start to think I’m losing it. How did we sign up for this? I’m reading it over and discovering it’s for the entire school year, five days a month, and requires drop-off and PICK UP! I didn’t realize the pick-up part until that moment. What! I’m supposed to lose a half hour of work a day to pick him up so he can stay ten minutes after school? So he can miss the bus by a minute? Why is this even offered to bussing students? How am I possibly going to do all this stuff? This is ridiculous. I can feel the tears and it’s only 7:30 in the morning. I’ve officially boiled over and the day has just begun. I know it’s a bit cliché to blame hormones, but they definitely played a part. This is not always the reason by any means, but some days I’m just extra-emotional. In fact, that morning I didn’t want to get out of bed but decided to get up and work out. Turns out staying in bed would have been better. Go figure; usually working out is the best way to start my day. I cried a good twenty minutes that morning with my brain reeling in negativity. At one point I even thought, am I losing it? Why can’t I just pull it together? I know it’s all in my head, so why can’t I just snap out of it? I felt so powerless. I hate moments like that. Moments like that, however, make me understand ever so slightly how it’d be to need more than my Feeling Good Handbook and a nap to feel better. Strangely, writing this makes me see how fortunate I truly am to have emotional moments, which I can recognize as just that: moments in time. I feel sad that for many others their emotional moments are not moments, but rather their everyday reality. My sad moments make me more aware and compassionate towards the people for whom the sadness doesn’t go away. 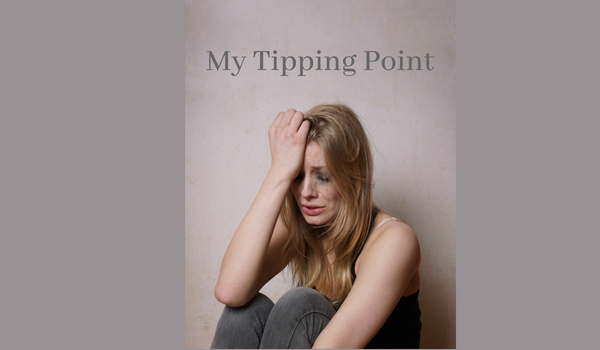 If you think back on the last time you hit your tipping point, is there a lesson to learn? Can you find the silver lining? This blog is one of a collection written by Marion B. Ruthig in her book, The Honest, Unfiltered Place of My Mind. We’ll be sharing out more of these blog’s throughout the year. If you have a favorite blog that relates to one of our eight focus traits (acceptance, curiosity, empathy, gratitude, kindness, self-awareness, perseverance, and collaboration) or six social causes (being socially responsible, embracing humanity, protecting our planet, supporting our troops and veterans, including seniors, and meeting basic needs) please share in the comments below or email it to marion@insideoutclub.org.